Is Masculinity Affecting Men's Health? Home » Men's Health » Is Masculinity Affecting Men’s Health? Long has the best health advice been to eat less red meat and more vegetables. (Along with other key tips.) But a new study has found that men are reluctant to try vegetarian products. It found that consumers are influenced by a strong association of meat with masculinity. And it could be impacting nutritional health. 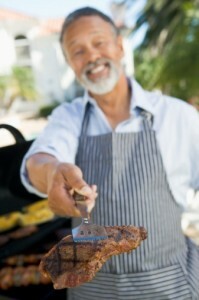 Researchers examined the possibility that there is a metaphoric link between meat and men. Such a conception is not difficult to imagine; look no further than barbecue season. The answer, they found, was a strong connection between eating meat — particularly muscle meat, like steak — and masculinity. In many experiments that looked at metaphors and certain foods, like meat and milk, the study found that people rated meat as more masculine than vegetables. They also found that meat generated more masculine words when people discussed it, and that people viewed male meat eaters as being more masculine than non-meat eaters. RECOMMENDED: Eating more soy can help protect against prostate cancer. Most studies were in the U.S. and Britain, though 23 languages were also analyzed. Across most of them, the word “meat” itself was actually related to the male gender. he would be eating a food that is considered weak and unmanly. If marketers or health advocates want to counteract such powerful associations, they need to address the metaphors that shape consumer attitudes, according to the study. For example, an education campaign that urges people to eat more soy or vegetables would be a tough sell — but reshaping soy burgers to make them resemble beef or giving them grill marks might help cautious men make the transition. Basically, most of the Western world eats too much meat. Soy aside, it often comes at the expense of vegetables. If we are talking about image, there probably aren’t too many vegetables that would fall into the “manly” category. Men would be wise to ignore such food stereotypes, rather doing what is needed for health. Replacing a red meat dinner with a vegetarian option would be a great step in making a more healthful diet.